"HIGHLY RECOMMEND! I love coming to this place. I always wanted to learn boxing, muay thai, and jiu jitsu without embarrassing myself. I tried a few other gym before coming here, but they were filled with too much ego-- especially from the students. I felt like I was on the karate kid movie! The vibe here at this gym is always positive! i started off with a free pass, then group-on, and eventually signing up! Everyone is here to workout, have fun, and learn new fighting styles. 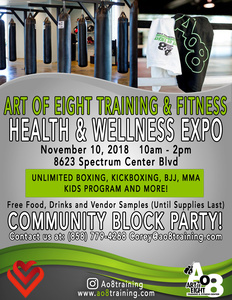 Join us on November 10th 2018 for our community block party and wellness expo. There will be lot's of vendors and samples! Bring your friends and family to try a free class or to just get some great wellness info! Ready for a free class? Sign Up Now! © 2019 Ao8Training.com. All Rights Reserved.